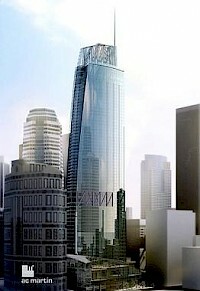 Wilshire Grand Center is a 335-meter (1,099 ft) skyscraper under construction in the Financial District of Downtown Los Angeles, California. It is the tallest building in Los Angeles and is also the tallest building in the U.S. outside of New York City and Chicago. Its height surpasses the U.S. Bank Tower by 81 feet.